With roughly 4,000 species of bees in the United States alone, you’re likely to see them around your home during the spring and summer. Although they aren’t much of a nuisance when they’re just here and there, they can start to take over your outdoor space quickly. Because there are so many different species of bees, it’s important to be able to recognize the behavior and nesting patterns of the most common ones you might encounter. Bees’ preferences for nesting vary by species. 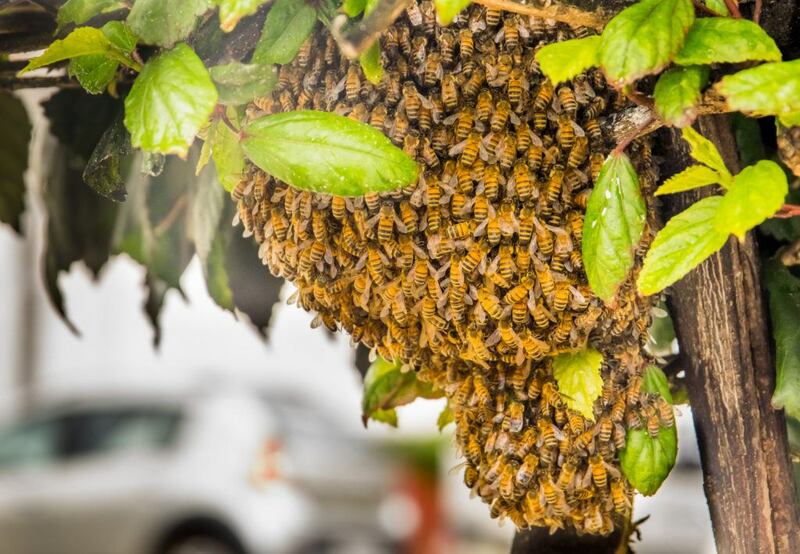 It’s important not to get too close to a hive or nest to try to identify the species—that’s best left to the professional exterminators at General Pest Control. Carpenter bees are named for their nesting habits—boring holes on exterior wood surfaces like little carpenters. Although carpenter bees typically attack untreated wood, they will sometimes choose stained wood for nesting purposes. You should regularly check the perimeter of your home to inspect for nesting holes. Honey bees tend to build their hives in the holes of tree trunks and in rock crevices. These round hives have a distinctive honeycomb structure that makes them easy to identify. Worker honey bees have special glands that create the wax that makes up a honey bee hive, and the hives are carefully crafted by worker bees chewing on bits of wax to make it soft and then molding the wax into a hive. Suitable places for nesting are usually on or beneath the ground, under some type of flat object like a wood board, tarp, stone, or deck. Holes from other animals like mice or chipmunks are also suitable for bumble bees. Identify the bee species – Identifying the type of bees present in your home will ensure we use the right treatment methods. We’ll look for key identifiers on the bees such as color, size, wing structure, and more. Locate & remove hives – Bee infestations happen quickly and although they typically only affect outside structures, having a large population of bees near your home can often cause them to be found inside as well. It’s best to get to the root of the problem by treating and/or removing nests and hives. Treatment for Carpenter Bees – If you find holes in a wood structure around your home and suspect the holes are from carpenter bees, we can assess the problem and inject an insecticide dust or pressurized aerosol into the holes. It’s also a smart idea to plug the holes in the fall. Plugging them too soon when they are still active may cause them to make exit holes in order to escape. Moving Nests and Hives – One of the most effective ways to treat a nest or hive and prevent them in the future is to remove it from your property. Our professional team has the proper equipment to handle hives and swarms of bees while abiding by state regulations on moving hives. Repair damages – Holes created by carpenter bees can sometimes invite them to return next year. Be sure to fill in the holes, ideally in the fall when they are inactive. Since carpenter bees tend to bore holes in untreated wood, you should consider treating wood structures with stain or paint to deter them. Clear your property of ideal nesting spots – Old rodent holes are ideal spots for bumble bees, so be sure to fill those in as you come across them. In addition, tarps, pieces of wood, broken flower pots, and other loose items around your property offer ideal protection for nesting spots, so be sure to keep your property neat and free of those types of objects. Remove old nests and hives – Treating bees with sprays can be an effective method for killing them, but leaving behind old nests and hives sometimes invites other bees to return the next year. In need of bee control and prevention at your home? Contact General Pest Control today to request a quote on an inspection and treatment. Our Seasonal Pest Control Program begins with a single treatment for a specific pest problem, and then includes treatments in the following seasons to ensure your home is protected from pests year-round. Click here to learn more about the program, or contact us today to get started.